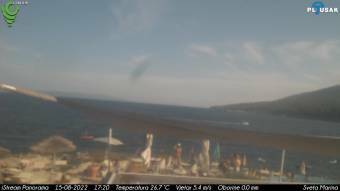 It's 14:58 in Sveta Marina, Croatia right now. Panorama Sea A beautiful panorama view of the Adriatic Sea at Sveta Marina. Rabac: Marina Rabac, 3 miles away. Labin: City View, 4.3 miles away. Barban: Town Center, 7.2 miles away. Valun (Cres): Promenade and Pier, 13.3 miles away. Svetvinčenat: Placa, 13.9 miles away. Mošćenička Draga: Livestream Beach, 14.8 miles away. Cres: View of the Adriatic Sea, 16.6 miles away. Cres: Weathercams, 16.6 miles away.